Part 1 of this series featuring illustrator Meilo So introduced her modern stories and parables. This post covers the bulk of her books - traditional tales and stories from cultures around the world. Want to learn more about Meilo So? Read this detailed interview over at Seven Impossible Things Before Breakfast. It includes some great "insider" pics too, including looks at her studio and work space. This in-depth interview with Meilo So over at Paper Tigers talks about her life, inspirations, and starting her own printing press. Visit Meilo So's web site here. 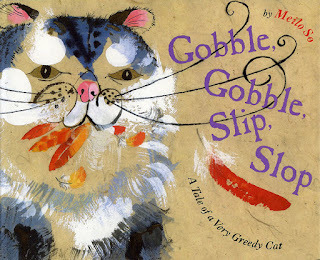 Gobble, Gobble, Slip, Slop: a tale of a very greedy cat (2004) by Meilo So. This story is a retelling of an Indian folktale recorded in 1905. The greedy cat finds that nothing can sate his appetite, and both the cat and the story continue to grow as he eats more and more. Only once he has eaten a pair of crabs does a solution present itself. 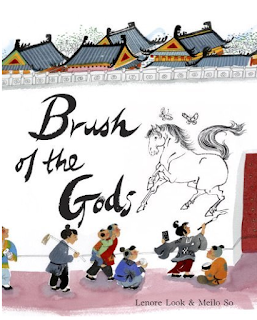 Brush of the Gods (2013) by Lenore Look and illustrated by Meilo So. This reconstructed biography details the early life and inspirations of Wu Daozi (689-759) a Chinese fresco and mural painter. Constrained by the limitations of calligraphy, Wu Daozi begins an exploration of figurative and imaginative art. As his final act, legend says that Daozi walked into his final painting … and disappeared. This delightful and enigmatic story will lead to many questions and great discussions about the power of art. You can read a brief interview with Meilo So about the particular challenges of illustrating this book, specifically how to integrate her artistic style with that of Wu Daozi. Click here to read it. 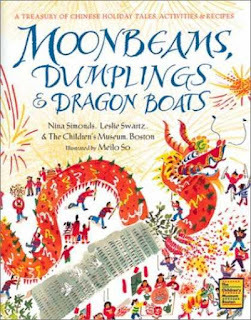 Moonbeams, Dumplings, and Dragon Boats: a treasury of Chinese holiday tales, activities, and recipes (2002) by Nina Simonds, Leslie Swartz, and The Children's Museum, Boston and illustrated by Meilo So. This book highlights stories, recipes, and activities to accompany five Chinese holidays: Chinese New Year, the Lantern Festival, Qing Ming and the Cold Foods Festival, the Dragon Boat Festival, and the Mid-Autumn Moon Festival. Every page is enhanced by Meilo So's illustrations and how-to drawings. This is a great resource for parents and teachers interested in learning more about these holidays. 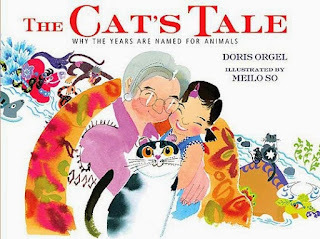 The Cat's Tale: why the years are named for animals (2008) by Doris Orgel and illustrated by Meilo So. This final take on the race story gives a different point-of-view, as the story-within-the-story is the cat relating her version of the race event. The frame story is also an important one about family and misunderstandings. Tasty Baby Belly Buttons (1999) retold by Judy Sierra and illustrated by Meilo So. This Japanese folktale features Uriko-hime, the melon princess, born from inside a watermelon. She is the only one fearless enough to take on the terrible Oni when they kidnap the children of the town in order to devour their tasty baby belly buttons. The whole premise of the story keeps kids engaged, as do her rather creative solutions. 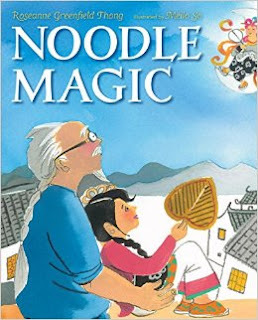 Noodle Magic (2014) by Roseanne Greenfield Thong and illustrated by Meilo So. This story, in the style of a Chinese folktale, features young Mei who learns, with her Grandpa Tu's encouragement, that true magic really does come from within. Meilo So's expression-filled style really shines in the noodle-centric illustrations, especially when Mei and Grandpa Tu are working together to slap, kneed, stretch, and pull the dough. 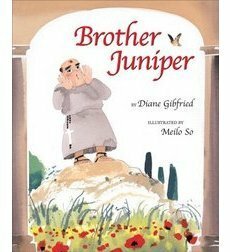 Brother Juniper (2006) by Diane Gibfried and illustrated by Meilo So. This story is based on traditional tales of Brother Juniper, a friar and friend of St. Francis of Assisi in the 1200s. The story highlights the importance (and rarity) of true generosity and its impact on others, but the ecclesiastical nature (and the fact that Brother Juniper gives everything away – including his robes) makes me unsure about the intended audience for this book. 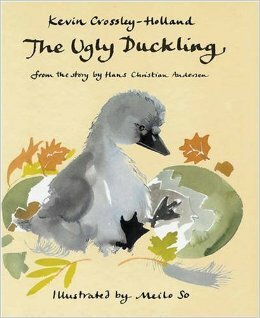 The Ugly Duckling (2001) by Hans Christian Anderson, retold by Kevin Crossley-Holland and illustrated by Meilo So. This classic tale gets an elegant retelling in this picture book version, and Meilo So's watercolors are an excellent addition. She captures wonderfully the many expressions of disgust and disdain from the other animals, as well as the hopelessness of the poor, ugly duckling. Part 1 provides an overview of modern stories and parables illustrated by Meilo So. Click here or the featured illustrator tag to see all the posts in the featured illustrator series. Thanks for highlighting this artist's work. I had previously only read one of these. Will check out some more now. I love reading profiles of authors and illustrators, it's so exciting to get a better look into the life and work of a creator!